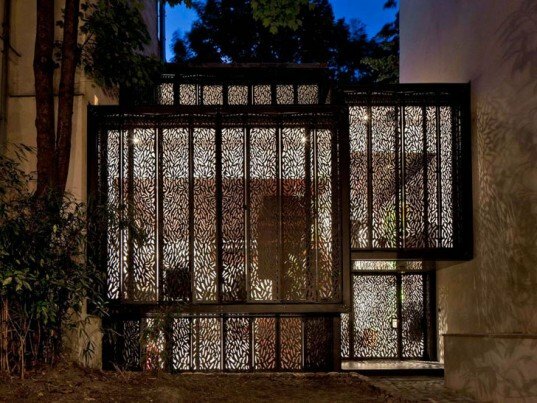 Located in Paris’ 6th arrondissement, Maison Escalier is a home designed by Moussafir Architectes and built on the site of an old house. Limited on three sides by the original walls of the building, this home has a tree-like structure wherein a staircase encircles a "trunk" that contains the wet rooms of the building. The south façade is entirely glazed and covered with shifting electronically controlled shades with leaf-like patterns that cast intricate shadows when the sun sets. These efficient design practices make Masion Escalier an interesting example of urban infill housing. The steel structure of the home is comprised of multiple cantilevered floors supported by the core of the building. 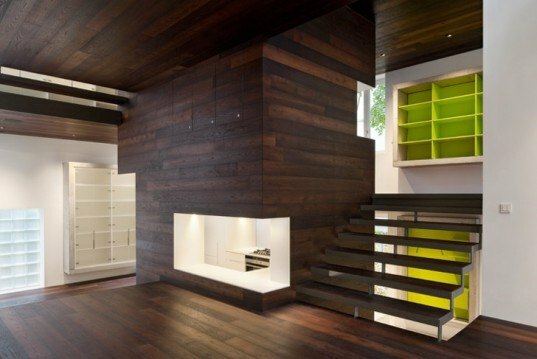 Through the integration of the stair, the whole of the house is an open floor plan with the only closed spaces being the bathrooms. No partition exists throughout these living spaces from the basement to the terrace on the roof. Each floor introduces a different view of the core of the home, and each space introduces lots of natural light. The daylight helps to keep this home from seeming too confined within its stone and steel walls. No partition exists throughout these living spaces from the basement to the terrace on the roof. Hints of lime green accent these concrete boxes to give the interiors some diversity of color. Daylight helps to keep this home from seeming too confined within its stone and steel walls. The interior of Maison Escalier is creatively designed with stark white-painted walls that contrast with rich, warm black locust wood floors and ceilings. Each floor introduces a different view of the core of the home, and each space introduces lots of natural light. These concrete boxes that are formed on the existing walls of the old building help to provide shelving, built-in furnishings, or accents around the house. The kitchen peeks through to other living spaces of the home from the core of the building. The black locust wood clads not only the floors and ceiling of much of the home, but it also clads the central core and staircase. Electronically-controlled patterned steel shades create shadows that imitate the leaves of a tree. 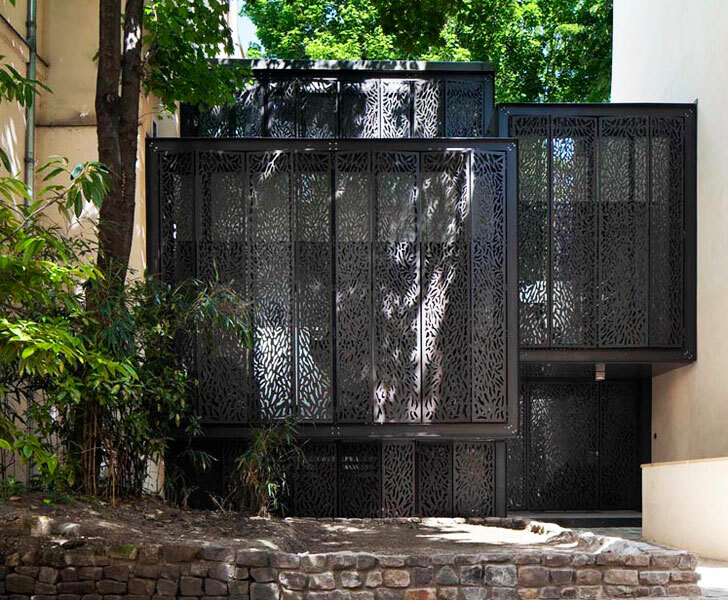 The home is located in the 6th arrondissement of Paris and is surrounding by existing buildings. The floor plans of the building show the circular evolution of the living space around the wet core.